Volunteers matter—especially when emergencies come up. At the Butte County Fairgrounds in November my husband and I found a mixture of hope and despair, of gratitude and anguish. 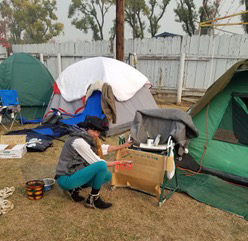 We couldn’t get near “Paradise Lost,” as reporters dubbed the Northern California town ravaged by fire, so we went to the tent cities at the Butte County Fairgrounds and the parking lot next to Walmart. We found unparalleled need along with volunteers helping those who’d lost everything but their lives. My husband and I took a huge stack of $50 gift cards donated by people in our church. We followed the suggestion of a church guest, who returned to Paradise on weekends. He was there with his wife, who barely made it out ahead of the flames. They’d lost their home but had each other. He said, “Take gift cards and give them directly to the people.” My husband loved the idea. What would you take with you if you had three minutes to escape the flames racing down the hill towards your home? Cash or pictures? A wallet or clothes? Your bankcard or your child’s favorite toy? What if you never bought insurance because you couldn’t afford it and now you had no cash for socks or a tank of gas? Admittedly a $50 gift card doesn’t go very far, but you wouldn’t know that from the reactions of displaced people who never dreamed of strangers handing them a gift card outside their tent. I will remember the shock and amazement on their faces forever. All we did was offer enough to fill a gas tank or buy a family dinner or “buy my wife a pair of pants so she can get out of her pajamas,” as one man said. Even though we’ll never see those people again, some will remember they were “visited by an angel” as a middle-aged woman told us while picking up her child’s toys. What a pleasure to see all the volunteers working directly with those displaced. Whether they were delivering the take-out donated by local restaurants, supplying hygiene products, or simply listening to those with a missing relative, they were providing a much-needed service. How the problem happened doesn’t matter. Finding a solution does. We all went there to be a part of the solution. The people in our church rock. Their generous donations gave us a chance to play Santa and Mrs. Claus early. With so much controversy over human behavior and ethics in this country, it felt good to remember that giving makes everyone a little richer. It’s the original win-win. B. Lynn Goodwin owns Writer Advice, www.writeradvice.com. She’s written Never Too Late: From Wannabe to Wife at 62 (memoir), Talent (YA) and You Want Me to Do WHAT? Journaling for Caregivers (self-help). Never Too Late and Talent are multiple award-winners. Shorter works have appeared in Hip Mama, The Sun, Dramatics Magazine, Good Housekeeping.com, Purple Clover.com, and Flashquake. 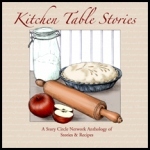 She is a reviewer and teacher at Story Circle Network. She lives east of Berkeley and west of the San Joaquin Valley with her husband and their highly intelligent terrier.